Eagle Superabrasives is a one-stop shop located in Hickory, NC that specializes in high-quality Superabrasive products and offers the best customer service in the industry. With an extensive inventory of over 6,000 diamond sharpening wheels, CBN wheels and other superabrasives supplies at our Hickory, NC, headquarters, we are able to ship ninety-percent of orders in the same-day. We can even fill custom orders in as little as seven days. Diamond Sharpening Wheels are ideal for working with materials that are non-ferrous. Because Diamond is the hardest mineral known to man, it only made sense to use it as a Superabrasive. 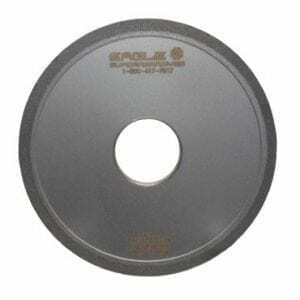 Eagle Superabrasives offers a Polycrystalline Diamond(PCD) which is ideal for sharpening and grinding purposes. Our PCD diamond sharpening wheels are created by mixing together sintered vitreous materials and carefully selected diamond powders, then applied to grinding wheels using a vitrified bond system. Our chemist and engineers worked together to specially formulate our bonding system to ensure minimal diamond pull-out and extending the life of the wheel. By incorporating a vitrified bond into our diamond sharpening wheels, many advantages are added. Firstly, vitrified bonds allow for an open structured grinding experience as well as cool cutting. Vitrified bonds offer high stock removal, precise finish and compatibility with conventional diamond dressers. When you’re ready to try the best, trust the experts at Eagle Superabrasives. Our experienced staff will provide friendly support and advice along the way. With unparalleled customer service, superior products and fast shipping, Eagle Superabrasives is an easy choice for all your grinding needs. Contact us today to place an order!